The only trouble with a journey to Edinburgh is that it’s quite long. By the time the train had gotten as far as Newcastle I was ready to get off, even if just through force of habit! We were distracted from the time north of Newcastle at least by the stunning Northumbrian coastline views out the window and the joy of crossing the Royal Border Bridge at picturesque Berwick. We finally gained Edinburgh mid-afternoon, emerging from the depths of Waverley Station to the crowd of Princes Street. As is tradition we went in search of a pub to recover from the journey. We rejected the nearby Wetherspoons on the basis it was too packed and full of tourists (thought the obvious tourists), though it did give the chance to be regaled by a coach load of people singing outside. We went in search of somewhere a little emptier, though didn’t really find it, settling for a crowded Tiles Bar where at least the tiled interior was suitably impressive, and it gave a good vantage point to watch the trams go by (trams are always exciting, wherever they are). Our hotel wasn’t far away so after a drink we walked round the corner and checked in, before heading back out to explore some of the city. There’s an interesting looking church immediately adjacent the hotel; all twiddly turrets although somewhat spoilt by the modern glass box of a foyer stuck on the end. That entrance also doesn’t look particularly inviting to potential visitors so we didn’t try and see inside, carrying on around the corner to the catholic church. We were going to investigate the interior of that but there seemed to be a service about to start, which we just managed to avoid getting swept into. Across the road were some giraffes (very appropriate given later jokes, though I wouldn’t be able to look them in the eye). The tall sculptures pointed us up into the main town, passing a view of the Regent Bridge with its peculiar triumphant arches sitting on top. It was at North Bridge that Edinburgh’s nature was revealed though, for it is not only a city of two halves but also of layers. Our hotel lay in the newer half of the city while the bridge took us across to the Old Town. The sense of height there is lost thanks to the roof of the massive Waverley station laying almost within touching distance below. 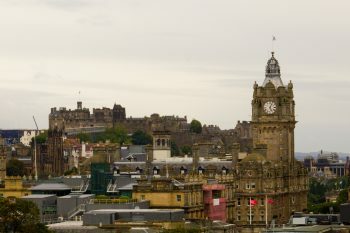 The Old Town sits above the once marshy valley now taken up by the station and Princes Street Gardens. A matching depression runs parallel, formed when ancient glaciers split around castle rock, so that the town layers itself in a sequence of bridges and hills, all tumbling and jostling for space. The effect is disconcerting as unexpected streets appear below, or briefly loom above, narrow wynds spilling down the hillsides from high ground to low. 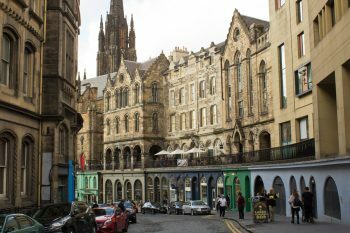 The road from the bridge intersects with Edinburgh’s most famous thoroughfare (actually a succession of streets), the Royal Mile. It was of course thronged but we made our way up it anyway, heading west up the hill towards the castle. 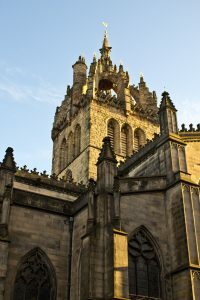 We got as far as St Giles, the cathedral which may technically not be, but is the High Kirk of Edinburgh. It’s an impressive building, its lantern tower in particular standing out (and reminding us of St Nicholas in Newcastle). 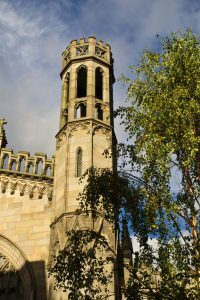 Outside is a peculiar, octagonal based structure which turns out to be the Mercat (Market) Cross. The base seems too large and squat for the slender column which rises from it, topped by the Scottish royal unicorn. Returning back down to where we’d joined the Royal Mile we headed on from the bridge to what must be one of the most photographed monuments in the country, that of Greyfriars Bobby. Having rubbed his nose for luck it would be rude not to briefly call in the pub next door. We made our way back along the way we’d been and then down the impressive sweep of Victoria Street, heading down the hill. As it falls a higher walkway runs along the buildings above the street, at the end of which we found the Castle Arms (in a sign of the multilayered nature of Edinburgh, while we entered from a terrace above the street and climbed some steps its main entrance is on a different, higher, road). There we found dinner—haggis of course for me (though this version came with a too spicy mash for my taste). It was getting late so we wandered back towards the hotel, calling into the Guildford Arms on the way back, before finding some sleep to prepare for a busy next day. Breakfast the next day brought a romantic trip to Patisserie Valerie on Rose Street, location of our first breakfast as us several years earlier, which was a lovely way to start our holiday proper. After breakfast we wandered down the rest of Rose Street and then around to stroll through Princes Street Gardens. The gardens lie in the once marshy glacial cut, which at one point was flooded to form the Nor Loch in defence of the castle. Since drained and landscaped the gardens are now a very pretty park, overlooked by the castle and Old Town above and strangely detached from the buzz of Princes Street just adjacent. We crossed The Mound, the artificial hill built from the New Town excavations as like to Old Town. Climbing the steep hill gave great views back across New Town and brought us to the Camera Obscura. The Camera Obscura is a marvel of Victorian technology. A squat little tower sits atop a building almost by the castle, rising high over the Royal Mile. Inside a light proof room forms a a snug, and very dark, space around a wooden table. As we sat around the table our guide then operated the controls of the camera, bringing to life a view of Edinburgh projected onto the table by a series of mirrors and lenses. It would certainly have been better if some people had heeded the warning not to use phones and the like, as the light would affect people’s vision. One woman continually used her giant tablet, much to the detriment of the experience. Still, she couldn’t spoil it completely. There Edinburgh lay, the view swinging from the Royal Mile just outside to various landmarks around. It doesn’t last long but it’s a joy to see such a simple piece of science and technology in action. On the floors of the building below the obscura are laid out what are touted as a “world of illusion”. 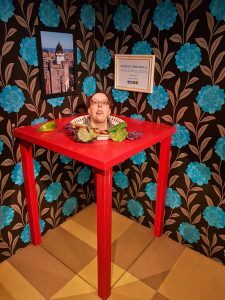 This contains an enjoyable, if slightly predictable, range of optical, and physical illusions, as well as some things which aren’t actually illusions but are quirky. So as well as Escher prints and stationary spirals which seem to move as they are stared at there are plasma balls, and a twenty-first century form of the obscura in a range of CCTV cameras trained on the street outside. It’s quite fun working through them all, and makes the admission price worth it. Towards the end there’s a “vortex tunnel” which I did not like! After looking through the little shop (as always) we exited to become proper tourists for a bit, working our way through the throngs on the Royal Mile and down to the George IV Bridge. There we paused and called into the pub named for the bridge. 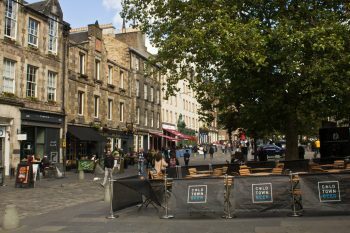 Having refuelled with a rest and a drink we crossed the road and headed down to the historic Grassmarket, before making our way along the cut of Cowgate. That feels like a back street these days, even as though it runs parallel to the Royal Mile. 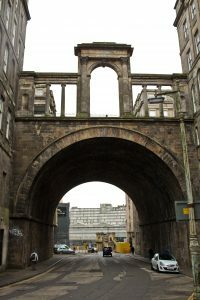 And it’s also strange, with the buildings we had just past looming over us, we walked beneath the bridge we had just been on, onwards until we decided to cut up one of the steep and narrow streets which link Cowgate with the Royal Mile itself. 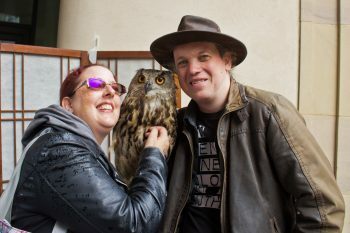 We started walking down the hill but Heather has a strange ability to keep finding owls in cities we visit so it was almost no surprise when we found two hiding in an archway with their handlers. Of course we had to go and say hello, and Heather had to end up holding one of them. They even eventually got me into a photograph with them. There was a little market next to the owls, which we explored though it wasn’t too interesting, before heading further on. Coming to Cannongate Kirk we briefly explored the surprisingly large churchyard of the Royal church, as it stretches back down the hill away from the Mile. 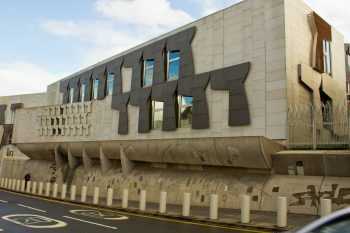 Nearby we there lies a fine old small Victorian school building, before the end of the Royal Mile is marked by the modern, bristling Scottish Parliament Building. Having stood by Westminster (countless times) and outside the Welsh version that marked the collecting of all the British parliaments/assemblies. We were by now hungry, and so headed in search of food. Unfortunately, despite being at the bottom of Edinburgh’s tourist trap, the pubs we found seemed to be determined to close their kitchens. One pub even stopped serving food just as we sat down. Eventually our tiring climb back up the hill brought us to the Cannon’s Gate, which was unnecessarily poncey and served me a pie which was just a lid over some meat (and therefore, not a pie). We headed back to the hotel after dinner, so that we could prepare for the night’s entertainment. 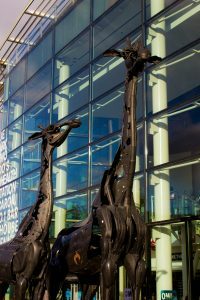 That was to be found just down the road, past the giraffes, to the Edinburgh Playhouse. We were there to see Dave Gorman, who was supported once again by the excellent Nick Doody. Before the performance there was a chance to buy a book of Dave’s Found Poems and collect a “Dave whacked my Google” badge (I swear I had one years ago). Not to give too much away but Dave was as wonderful and funny as always, and the giraffe joke meant I couldn’t look the statues outside in the eye when we left. We had a nightcap in the pub next to the theatre (confusingly called the Theatre Royal Bar), trying not to get too annoyed at the Canadian girl sat near us, before heading to bed. The following morning, after Heather had found some breakfast in the hotel, we started to head for the old town again, detouring slightly to take us past Fopp along the way, which made us smile 🙂 We crossed the mound again, following it around to the Royal Mile and then heading up to our destination—the castle. 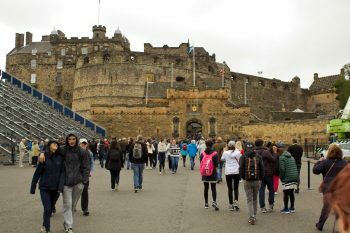 The approach to the castle should be impressive, the walls looming above as one walks up the hill of the Royal Mile. Sadly that view was spoilt by part of the stands put in place for the military tattoo stretching across the road. Even when we’d passed underneath the main stands blocked the views to (and access to) the sides of the esplanade. The stands were being deconstructed but it’s a shame they were up so long. The castle probably looks its most “castley” from the approach along the esplanade. The walls rise high above the gate in front (actually a late nineteenth century addition to deliberately make things look impressive, or at least more like a Victorian ideal), and despite the large penetrations to allow cannon fire one gets the impression of the strong fortress. Inside a lot of that sense has been eroded by the years of evolution, both in wartime technology and role. It took us an age to get in to see that for ourselves however as we stood just within the first gate in a winding, seemingly never ending queue for tickets. Eventually we did make it in, heading up the access road (ignoring the shop for now) and through the Portcullis Tower and Argyle Tower. Beyond the castle rises steeply towards the inner ward on one side, while in front a cannon battery (still with a row of cannons) stretches out above the northern cliffs. The Laing Stairs lead up the steep cliff, once the route into the castle from here. We took the easier option though, heading up the cobbled road developed to ease the movement of those cannons. 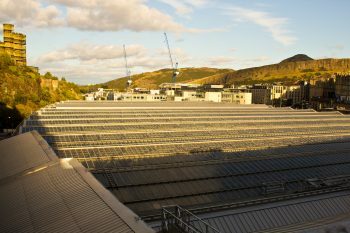 The views from the battery are fine, looking across Princes Street Gardens and the New Town with its ordered grid of streets beyond. It’s also gives a sense of the security of the rock, towering high over what would have been the relatively empty land below. Next to the cannons a small projection holds the One O’Clock gun, the famous time piece of the city. At one each afternoon the gun is fired, its booming sound marking the time in conjunction with a time ball atop the Nelson memorial on distant Calton Hill. Originally important information for the ships in Leith harbour (visible from the vantage point in the distance), it’s now a popular tourist spectacle. It wasn’t that late in the day yet though, so we continued our exploration round to semi-enthusiastically wander around some of the more modern buildings, looking into some of the old prison cells and barracks. 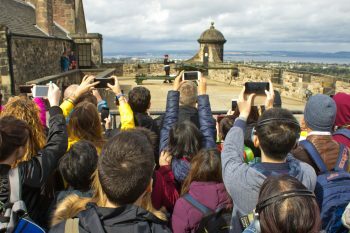 It’s an area that’s symptomatic of the issue with Edinburgh Castle—once inside, beyond those high outer walls and cliffs, it doesn’t feel very much like a castle. There is the feel of a military base but the sense of that fortress history is missing. 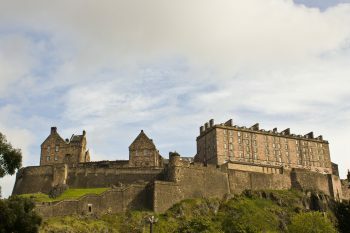 Where as some castles retain their medieval nature, and others can be read in their evolution over different periods, Edinburgh has been frankly totally destroyed so many times that the earlier periods are washed away, almost traceless. The rock is such a naturally defensive place that its occupation basically predates reliable history. There is mention in a Welsh epic poem around 600 AD and the castle appears to be the “Castle of the Maidens” the late eleventh century. 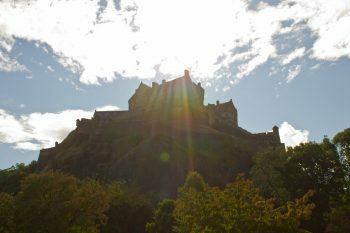 David I established Edinburgh as seat of royal power in the twelfth century and it seems likely this began the castle’s life in stone, as well as it’s frequent changing of hands between the Scots and English. 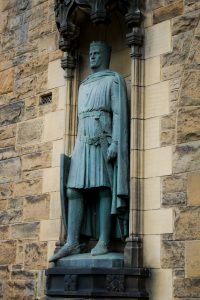 Any work done by that great fortress building Edward I of England was soon slighted by Robert The Bruce. The final medieval castle elements of the fourteenth century, including the mighty David’s Tower, were pretty much raised by the Laing Seige of 1571–3. 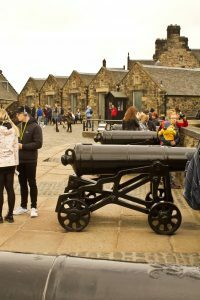 The castle defences were rebuilt with a clear eye to artillery and it is these, together with cosmetic additions, and the domestic buildings, which give the castle its character today. Sadly there seems to be little desire to give any information on those previous incarnations within the castle. We made our way up towards one of the few traces, passing through Foog’s gate (seventeenth century and probably named for the fog which would envelope the castle) to the inner bailey. There sits the oldest surviving building, both in the castle and Edinburgh, the tiny St Margaret’s Chapel. 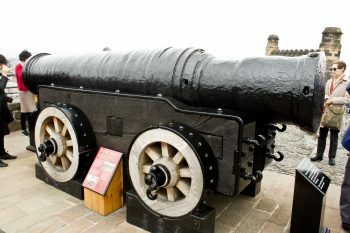 It is perhaps ironic that before reaching it one is confronted by the giant bombard known as Mons Meg outside, the ultimate representative of what did for at least some of the castles previous incarnations. There’s also a cute little dog’s cemetery on the hill below, last resting place of pets and regimental mascots. The chapel itself is small but neat, with a nicely chevroned chancel arch and some modern stained glass, though its difficult to see thanks to the inevitable crowding of tourists. Back past the chapel and top of the Laing Stairs stands the distinctive Half Moon Battery, its semi-circular form build above and around the fallen David’s Tower (apparently there is access into the remnants of that tower somewhere, but there didn’t seem to be any signage to show where so we missed it). 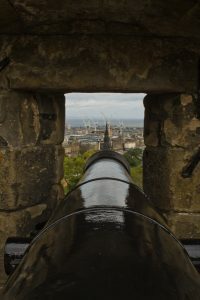 The battery is pierced by more cannons, a few of them seemingly ready to destroy the distant Scott Monument below. The Royal Palace adjoins the battery, the other side of which is Crown Square. That square is dominated by the overbearing Scottish National War Memorial, a building built to cathedral proportions (and style) with feels as detached from the horrors of war as the luxury of the palace beside it. I avoided the building, disapproving of such sanitisation as goes with such things, though Heather wandered round. The memorial forms one side of Crown Square. Another is formed by that palace building, which now houses the Honours of Scotland, AKA the crown jewels. The queue to get in and seem them was, however, enormous (a sign some way down the queue outside warned of an hour’s wait from that point) and we’d really had our fill of queuing earlier, so we didn’t bother trying to enter. We did look around the great hall, which probably dates from the early sixteenth century though its current appearances is mainly thanks to late nineteenth century re-workings. 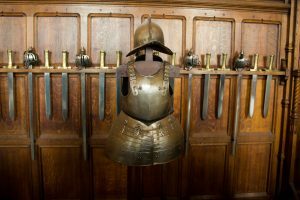 The walls are lined with swords and other weaponry, including early guns, and suits of armour stand around the place. A large fire impresses at one end, above and to the side of which is a metal grill known as the Laird’s Lug, giving a discreet way for a lord to spy on those below! At that point we realised it was nearly one and so tried to find a view of the time gun. It seems everyone else had the same idea a little before us, crowding round the chapel to overlook it. We took off down the Laing Stairs, but found nothing better than the back of the crowd as the gunner emerged and waited patiently for the clock to come round before firing the signal. There was a brief diversion to yet another artillery battery sitting on the northern cliff face before we were done with the castle, heading back down through the portcullis gate and calling into the vaguely disappointing shop. So we left the rock and the fortification that feels more like a castle from the outside than in. Touring the castle was tiring so we soon found our selves in a pub to rest. Unfortunately the Jolly Judge was a little strange and, to be frank, smelt. We quickly left then and found our way back down to the Grassmarket and (reputedly) Edinburgh’s oldest pub, the much finer White Hart. It was certainly welcoming (if, as most pubs in Edinburgh seemed to be, a little under staffed) and we found haggis for me (much nicer than the Saturday’s effort), and a vegetarian (!) version to please Heather. We still had some of the afternoon left so looking around for more to do Heather decided she’d like to visit Holyroodhouse, which isn’t my cup of tea. I left her to head down the Royal Mile but part way back towards New Town realised Heather still had my hat in one of the bags she was carrying, and it was starting to rain. So I went chasing down the hill after her, finally catching up almost at the bottom but retrieving said hat! Again I left Heather to her own path, though it turned out that by the time she reached Holyroodhouse it was just after last entry and they wouldn’t let her in, so she ended up at a Canaletto exhibition in the Queen’s Gallery next door. I meanwhile headed briefly back to the hotel before heading for Calton Hill. 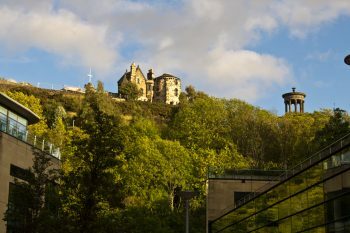 You can actually get to the access to Calton Hill by carrying on up Princes Street but I took the rather more strenuous route up round the steep hill. 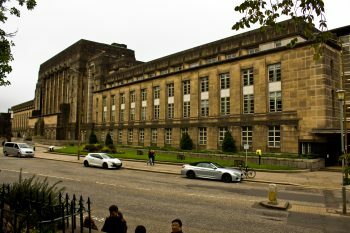 The view opposite the hill is dominated by the huge St Andrew’s House, an art deco influenced office block which is headquarters of the Scottish government. Up the hill itself and a pleasant park landscape leads to a scattering of buildings. 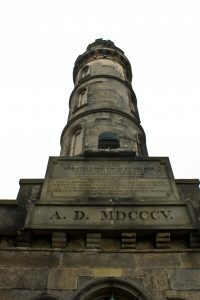 As one climbs the stairs up the Nelson Monument towers in front. 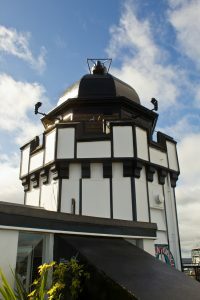 There is the Greek temple style monument to Dugald Stewart (an eighteenth century philosopher and mathematician) to one side and the path swings around the hill to the Old Observatory House, behind which lies the observatory itself (at the time it was undergoing building work to transform it into some exhibition space or other). The top of the hill is dominated by two structures however. 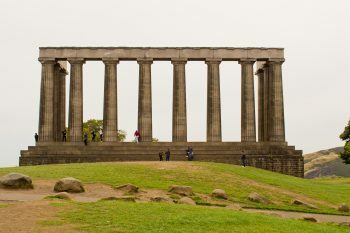 Sitting like a displanted Greek ruin the National Monument was begun as a memorial to those killed in the Napoleonic Wars but quickly ran out of money, leaving the Parthenon like structure with only one real side—a state of affairs which has led to it being called “Scotland’s disgrace”. 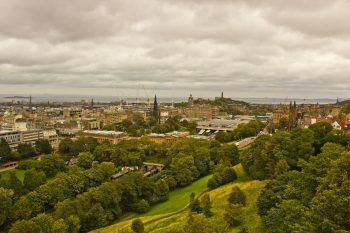 The views from around it are far from disgraceful though, the city laid out around the hill, the Firth of Forth glittering in the distance with a glimpse of its famous bridges to the west, and the castle on its rock further round. The other, most obvious, structure on the hill is the Nelson Monument. In form like a telescope placed to stand upright at the top of the hill it towers over most of Edinburgh. Despite the wind and now constant rain I couldn’t pass up the chance to climb the spiral staircase within to the viewing platform which runs around the top. From the peak the undulation of Edinburgh is clear, it’s bridges cutting across the Waverley valley as it runs from the castle (which looks more impressive from this distance than it had from within). I couldn’t stay long so exposed to the weather so headed back down, taking in the peculiar little display of astronomical instruments in the rooms at the bottom of the tower. My timing was good anyway for as I was wandering back across the summit of the hill, past yet another cannon, Heather informed me she was on her way back to meet up. I reached the Regent Bridge, peering down at Heather as she made her own way back around the foot of Calton Hill before we met up again by Waverley Station. All the wandering meant we decided to have a rest in the hotel before venturing out for the evening. Refreshed we headed for Rose Street, and in particular the Kenilworth which holds special memories from those years ago. Having reminisced there we went along the road to the Rose and Crown for some food. They seemed to take quite a long time to actually manage to deliver (and seemingly closed the kitchen) but I forgave them due to my haggis bites starter, a concept I wish would make its way south. After food we wander the rest of Rose Street and through the New Town back towards the hotel, finding ourself in The Conan Doyle on the corner (the pub’s namesake was born nearby) for a nightcap before bed. 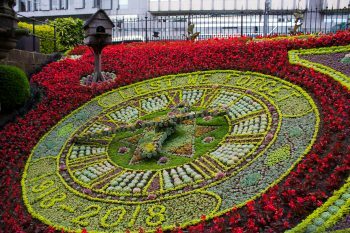 The flower clock this year marking 100 years since the end of the first world war. 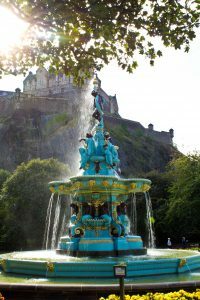 Our final morning in Edinburgh saw us leave the bags in the care of the hotel and finally get to actually take a tram, riding it to most of the way down Princes Street before alighting and heading to Patisserie Valerie for breakfast again. From there it was back to Princes Street and a walk through the gardens. That took us round the back of the Scott Monument and along to the floral clock (which seemed to be telling the wrong time sadly). A walk through the station, worth it to take in the beauty of the booking office, brought us to the foot of Calton Hill and down to New Calton Burial Ground (built when Waterloo Place was driven through Old Calton Burial Ground, with several hundred bodies carefully moved to the new ground). 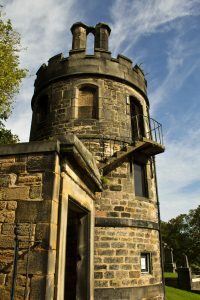 There’s an interesting circular watchtower (to guard against grave robbing) and a still standing example of a gas lamppost. Reaching the bottom of the hill by Holyroodhouse we headed back up the hill of the Royal Mile to the Museum of Childhood. Perhaps we’ve been spoilt by the one in Bethnal Green but it turned out to be a little disappointing. The ground floor starts well enough, with a fair few things we recognised and the usual suspects. Beyond that though the slightly maze like building is poorly signposted, making one never sure if one is missing anything, and contained little from our youth. Even a promised children’s literature exhibition, once we’d found it, was short on the books which influenced us. Still, it was an easy way to spend a bit of the morning. Emerging, Heather decided she really did want to see Holyroodhouse so we headed that direction, to the bottom of the hill where I left her again to go off on my own wanderings. Climbing back once more up the Royal Mile I got bored of that stretch of road and so turned off part way, finding my way to the top of Cowgate. I followed that ancient route along, beneath the bridges thronged with tourists, to the junction with Grassmarket. From there it’s hardly any distance up Candlemaker Row to Greyfriars Kirk. The churchyard is an atmospheric place, full of interesting tombs (and tour groups), as well as the remains of The Flodden Wall. 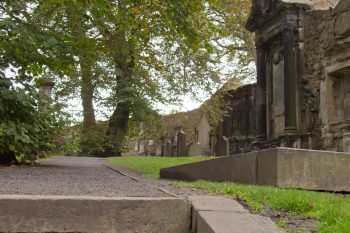 The most famous attraction of the kirkyard must however be the memorial to Bobby (though the granite grave marker dates only to 1981), the faithful dog whose statue stands just outside. Tourist sight seen I headed back down Grassmarket and up the far side, looping around the castle to take in the less seen views of it. That eventually led around to the start of Princess Street so I headed along, weaving in and out the gridded streets of Old Town. That had all taken so long that Heather was done with Holyroodhouse and so we met back up over by the Royal Mile. Hungry we called into No 1 The High Street for some lunch, which we suddenly realised we must rush for we were running out of time. A dash back to the hotel and we were able to catch a tram with the bags—though we got off a stop too late (they could do with one right by the station). So in a blur we found a train and left Scotland behind. The post Capital Up North was first published on Monday 29th October 2018 at 8:54 pm but relates to events about 1 month earlier from 8–11 September .